The Bible text itself is the New Living Translation. It’s not my favorite, but it’s not too bad as far as paraphrases go. I won’t focus this review on the NLT or its features, but I will say that I’d love to see an NRSV edition of the Jesus-Centered Bible come out. The introductory note by Rick Lawrence was a bit off-putting. For some reason, he assumes that readers will have never heard of C.H. Spurgeon and that we won’t understand the word beeline. Potential insults to our intelligence aside, I find it disconcerting that he points to Spurgeon as a model for Jesus-centered interpretation. It’s certainly true that Spurgeon claimed to find Jesus in every passage, but his results were far from satisfactory. He was a raging Calvinist and a firm believer in the idea that God tortures unbelievers for all of eternity. Such a God looks nothing whatsoever like Jesus. And so, when Spurgeon “found Jesus” in the Old Testament, it usually meant that he found a way to force Calvinism or penal substitutionary atonement into the text. Either that or he would invent absurdities, such as claiming that the sexual innuendos of Solomon’s Song actually refer to Christ and the church. Yikes! Don’t misunderstand me. I absolutely believe that Jesus is to be found in the Old Testament. In fact, I’d go so far as to say that we cannot correctly understand the Old Testament without a Jesus-centered interpretation. But there’s a right way and a wrong way to go about this. Charles Spurgeon is the perfect example of the wrong way. That said, many of the contributors to this Bible—such as Tony Campolo, Bruxy Cavey, William Paul Young, and Brian Zahnd—are excellent examples of the right way. So we’ll see which model is actually followed in the notes throughout. It’s worth noting that this is called the Jesus-Centered Bible, not the Jesus-Centered Study Bible. The notes are largely devotional in nature. This is not necessarily a bad thing, but it is something to be aware of. They shy away from answering many of the really hard questions about the Old Testament that a Jesus-centered interpretation forces us to ask. Bruxy Cavey’s introduction to Leviticus is fantastic! He clearly shows that God never wanted a system of sacrifice—the Israelites just borrowed that idea from the surrounding pagan nations. However, the notes sometimes contradict his introduction, such as the “Reframing Jesus” note on Leviticus 5:10, which suggests that the sacrifices actually did make people right with God. I really enjoyed the note on 2 Samuel 12. I’ll just quote a section of that here. From the very beginning of the Bible all the way to the end, the story of God is about God’s relentless pursuit of his creation. God’s dream for this world is to see it redeemed from brokenness and restored to wholeness. In short, God wants to make all things new again. You. Me. All creation. Every inch of it. God wants to redeem it, restore it, and make it whole and free once again. This is God’s dream. This is God’s relentless pursuit: to destroy evil and hate, to bring love and peace. This pursuit has a name. His name is Jesus. I also appreciated the note on Psalm 22. Commenters on Matthew 27:46 frequently assert that God somehow abandoned Jesus on the cross. But this could not be further from the truth. Jesus simply quoted the opening line of Psalm 22, pointing toward his fulfillment of the entire psalm. The psalm ends by making it clear that God never really did abandon David. And God never abandoned Jesus either. The note on Psalm 22 makes all this clear. I was happy to see that Kelley Nikondeha’s introduction to Song of Songs downplays the idea of using it as an allegory for the relationship between God and the church. And the notes throughout thankfully avoid Spurgeonesque pitfalls. I was much less happy with the note on Isaiah 61:1–2. The blue text went all the way to the end of verse 2, even though Jesus, when quoting it, deliberately excised the final phrase, “and with it, the day of God’s anger against their enemies.” The note says that Jesus used these words to identify himself as the Messiah, and that he declared their fulfillment. But without noting that Jesus cut out the part about vengeance, this fulfillment would look entirely different than how Jesus actually fulfilled it. Some New Testament highlights include Bruxy Cavey’s introduction to Romans, William Paul Young’s introductions to Hebrews and 1 John, and Brian Zahnd’s introduction to Revelation. The notes and intros I’ve summarized above should provide an idea of the mixed bag they offer. There’s some really great stuff in here, but it’s inconsistent. Perhaps that’s the result of so many different voices weighing in. And perhaps that’s not even a bad thing. After all, that mirrors the Bible itself, with its multivocal approach to understanding God. Some of the biblical authors get closer to the truth than others, but the ultimate Truth is only found in Jesus. The same can be said for all of the contributors to the Jesus-Centered Bible. All-in-all, the Jesus-Centered Bible is not perfect, but it’s a huge step in the right direction. I thoroughly commend the effort, and I hope that a later edition will make it even better. But don’t just take my word for it. Check it out for yourself. 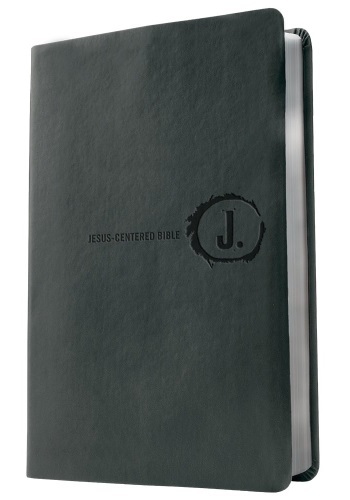 Pick up your own copy of the Jesus-Centered Bible as a hardcover or in turquoise or charcoal imitation leather.